No tension, excitement, or interest, amateurish action, and lousy CGI’s.That’s “Resident Evil Retribution” in a nutshell. Even die hard fans of the series will agree with me this time around. The 5th installment is the worst one so far and I demand an explanation. I never expected Shakespeare but I guess I never expected it to be this bad. After all, There’s nothing wrong with a film about killing zombies thoughtlessly, if that film contains loads of great action set-pieces, but “Retribution” has too much downtime and takes itself way too seriously to succeed at being campy-fun. 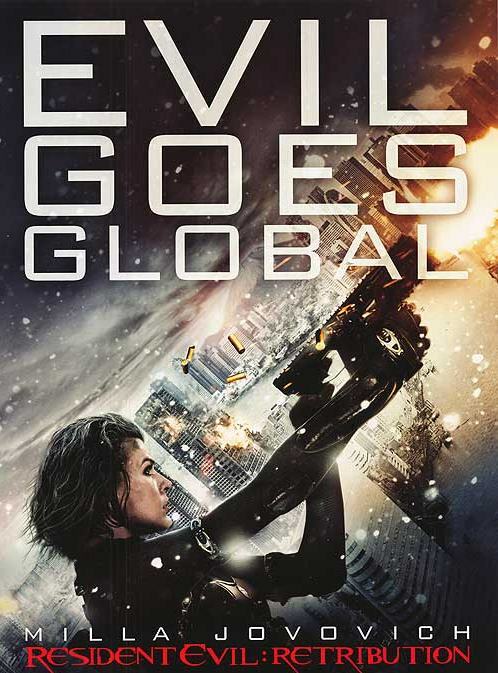 Following the events of “Afterlife”, Alice finds herself recaptured by the Umbrella Corporation after her escape to Arcadia, a cargo tanker that was meant to be a last safe haven for what was left of the humans. Brought to a large underground facility where each cavernous section is made to resemble one of the major cities of New York, Moscow and Tokyo, Alice teams up with Ada a survivor also captured by the Umbrella. Or something like that. What follows is a series of non stop action sequences that would have been cool if the story actually reached a satisfying conclusion. But it doesn’t. Instead, it teases us by announcing that there will be at least one more sequel to come (how awful!). The plot barely offers any surprises and fails to stay on rails. Devotees “may” enjoy it more than others, who, in the unlikely event they watch, will find it repetitious, unimaginative, and routine. Personally, I say enough already. I agree with you on this one. I still remember those dreaded minutes, waiting for the stupid and endless action scenes to end. I want to make something clear, I don’t hate action movies, but really…what’s the point of making a simple first person shooter into a movie. Maybe it’s a bit late to complain since this is the fifth movie in the row. And yeah, sure they made a new plot for the movies, but what is the point of a 20 minute shootout against zombies, when the audience already knows the heroes will win?! At least put some twist in there, something new and less repetitive. And speaking of heroes…I still can’t believe the actors they chose for some of the original game characters. They could have picked a dozen better people to play Leon. As A person who has played and loves the RE games, I find this movie offensive. When will they learn that some games aren’t meant for the big screen no matter how much you twist and poke the plot? !